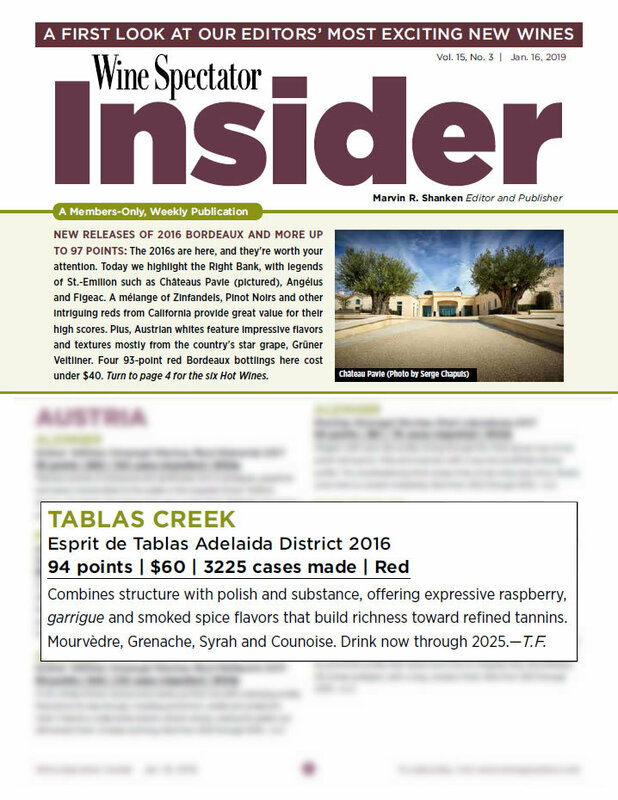 The Tablas Creek Vineyard 2016 Esprit de Tablas is a blend of four estate-grown varietals, propagated from budwood cuttings from the Château de Beaucastel estate. The wine is based on the dark red fruit, earth, spice and mid-palate richness of Mourvèdre, with additions of Grenache for forward fruit, approachability and lushness, Syrah for mineral, aromatics, and back-palate tannins, and Counoise for brambly spice and acidity. A deep nose, marked equally by Mourvedre and Syrah: mocha and currant reduction, chalky minerality and spicy eucalyptus. The mouth is dense yet not heavy, with flavors of sugarplum and rare steak, a reverberating red/black licorice note, and tremendous texture. The long finish, with lingering flavors of wood smoke, roasted meat, plum skin and crushed rock, hints at more rewards to come with cellar aging. We recommend that you drink either 2018-2021 or again starting in 2024 any time over the subsequent two decades. The grapes for our Esprit de Tablas were grown on our certified organic estate vineyard. The grapes were fermented using native yeasts in a mix of 1500-gallon wooden upright fermenters, open-top tanks and closed stainless steel fermenters. After pressing, the wines were moved into barrel and allowed to complete malolactic fermentation. The Esprit was selected from the vintage's best lots and blended in May 2017, then aged in 1200-gallon French oak foudres for another year before being bottled in July 2018.